Illuminations of Light LIVE! Presents…Reiki Guru Jyotika! Greetings and Salutations One and All! Welcome to this week’s blog close up on our amazing guest! She worked with Mother Theresa for years in Calcutta and has formed numerous foundations and is most recently focusing her work on healing through food! So without further adieu here is a bit more about our lovely guest tonight! ReikiGuru Jyotika is an internationally renowned Sensei/ Healer of USUI Japan and a certified Ayurvedic Health Prefessional from Maharishi University of Ayurveda..She is the performer of world’s first cosmetic surgery with Reiki and many miraculous cures, and has been featured in the press and TV media worldwide. 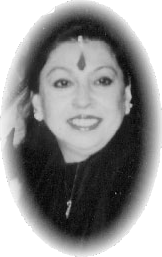 Jyotika has served as the chairperson (eastern countries) of the intl. society for Autistic children for 3 consecutive years. She has worked in close contact with Rev. Mother Teresa since the age of 16, helping the lepers, the old and the sick.It is therefore not surprising that today she is extending her’ healing touch’ to releive pain and suffering of all kinds. As a tribute to her own Healing work, Jyotika chose the auspicious day of Gurupurnima, last month, to launch with her son, JJ Prashant, Ayur Ras Healing Foods, a pure, fresh and organic Indian cuisine line based on the principles of Ayurveda.